Kick off your gameday spread with this satisfying snack. 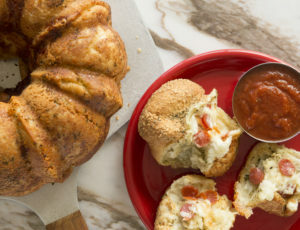 A gooey cheese center with a flavor-loaded crust makes these the highlight of any party spread. Spray counter lightly with non-stick cooking spray. Cut each in half. Flatten each roll into a 2-inch circle. Place 1 piece of mozzarella cheese on each circle. Pull edges of each dough circle up to completely enclose filling. In a small bowl melt butter. Place corn chips, potato chips and Parmesan cheese in separate bowls. then dip each filled roll in butter mixture and then into one of the other coating bowls. Place filled rolls on a large baking sheet pinched side down. Bake at 350°F 12-15 minutes until golden brown. Note: To crush chips, place them in a ziplock bag and crush with rolling pin or hands.